So, after sneering at the Star Wars books my whole life as pulp fiction, then being pleasantly surprised by the gripping Thrawn Trilogy and Hand of Thrawn duo, I boldly sallied forth to the "Sci Fi" section of the used bookstore. It was a bewildering place, full of garishly colored covers with strange aliens and melodramatic titles, all on those small fat volumes that I had spent most of my life avoiding. But my husband's birthday was in a few days, and with the best bits of the Thrawn books still ringing in my ears, I looked at the section with new respect, thinking what deep questions or compelling characters lay buried behind those garish paperbacks. I bought him the first 3 books of the "Exciting New (in '96) X-Wing Series! ", its cover illustrations glam shots of X wings, Tie fighters, and space stations, downright respectable looking. It made me realize how much Zahn really understood women, and (cough, cough) The Universe (because we're just that important). So, Zahn understands how women tick. He knows they want respect, and more importantly, what kind of respect. He knows what they find attractive in a guy. And what behaviour impresses them, especially even after he's let you down. He knows how they feel about their honor, past relationships, children, and loyalty. He knows how they want to seem, how they want to be portrayed, and especially how they fight (with guys). 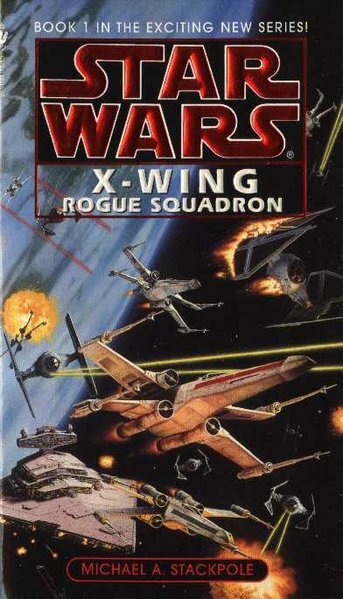 In the very first book "Rogue Squadron" the main girl finds herself thinking the main boy is awesome, despite not wanting to, because his dad did something mean to her dad. Oh the romantic tension! Very standard so far, girl with mixed feelings for guy, what is she to do? Hit on him, to try to hook up with him, so she'll despise him, so she won't think he's awesome, so she remains loyal to her Dad in not liking this guy. I humbly suggest this as the new cover to Rogue Squadron. And in the meantime, I declare only Zahn's books to be Star Wars Canon for books. Zahn's star wars books were infinitely superior. First off, his characters operated in a world that felt like, well, a world with old people, and kids, and convoluted mid-life crises grownups, and young people, etc. Stackpole's world feels like a perpetual high school world, populated only by high schoolers. Secondly, HIS WOMEN ACTED LIKE REAL WOMEN. They think, fight, and show their loyalty, like real women. And best of all, they're kinda awesome. And they don't throw themselves at guys in convoluted logic circles to make themselves not like them. And the guys that like them actually respect them, a lot. And the women also have awesome ninja skills, which they don't use to wantonly kill, but to protect those they are fiercely loyal to, like she-bears. Thirdly, there is a moral structure to the universe. It's implied. You see stable marriages. You see a husband holding his wife while she's going through labor. You see farmers getting in TIE fighters to defend their homes, you see the hero fight like a teenager and then humbly apologize, you see the bitterness that tears apart worlds when race crimes are not forgiven, you see people bothered by sketchy pasts, you see a middle aged man trying to make things right with his octogenarian mentor, and you see a woman looking through the dysfunctions of her friend-turned-assassin and choose to love and choose to forgive. Its a moral universe that feels real. 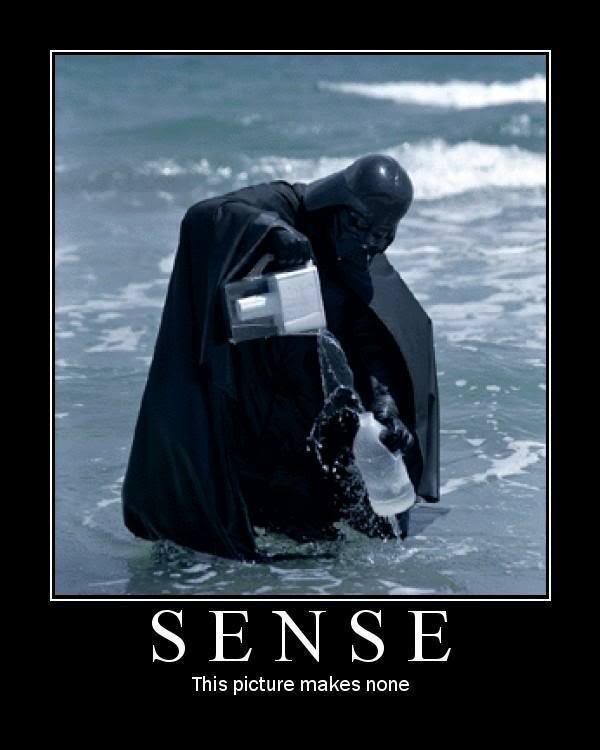 That has real repurcussions to things. In which dying to yourself, and protecting the weak, and repenting of pride, and forgiveness is the only way to peace. It is a world which has a sky. Was there a couple weeks ago. Sniff. It was so beautiful. Clouds. Especially clouds catching the light. Ignore the weird face. But the picture shows the tunic well. JOSH CAUGHT ON (MY) CAMERA SMILING!!!! 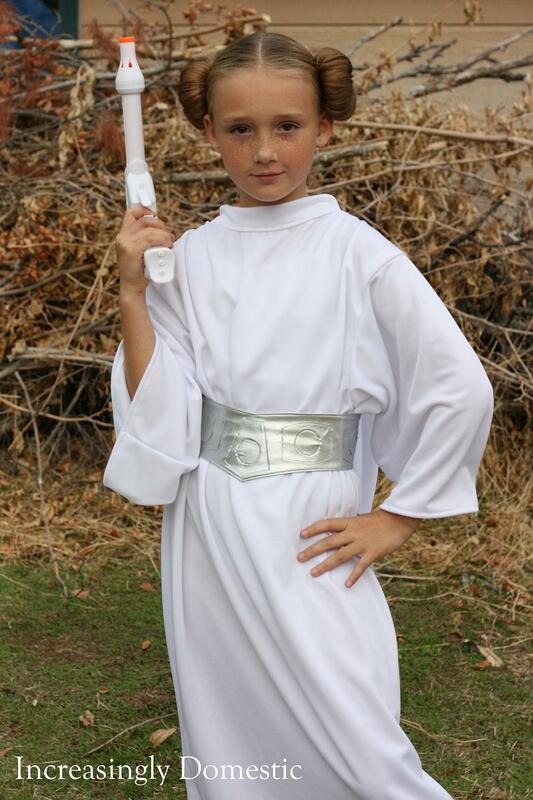 As a kid, my Daddy took us to see the rerelease of Episode IV of Star Wars in theaters. I'd tried to to the hair before, but never got any where, as Alderanians evidently either have about 4x the hair thickness and volume as the rest of us humans have, or Princess Leia used hair extensions. I think I'll opt for the former. 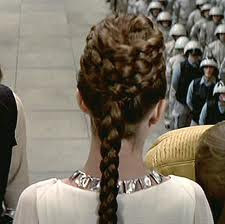 I'd seen wigs for the Leia Classic hair, but they all looked, um, like wigs. I'd even attempted once with hair pins to make my sister Leah's hair do this, but despite her God-given incredibly thick hair (jealousy alert, sob sob), I couldn't get it to stay firmly. So I gave it up as only a wig-possible type of hair. And not being into wigs, I just gave up on it. Amy at Increasingly Domestic used sock buns to make her daughter the most convincing Princess Leia classic hairstyle I'd ever seen. SHE LOOKS AWESOME. 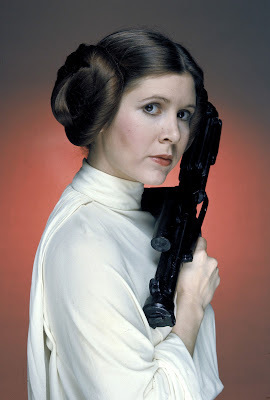 SO now that I am inspired by this sock bun technique to try a few Leia hairstyles, as well as invent a few Star-Wars universe (not the travesty that is Ep I-III) plausible styles that I think people like Shada D'ukal would have worn. About Shada D'ukal's hair, all we know from Zahn[i.e. the only canonical Star Wars writer in Hannah's Star Wars Canon) (and if there's a comic book out there with her pretense of her likeness, forget it) is that Shada wore her hair with needles and braids at least 4x, irst at the Whirlpool (where she used them in battle, a few weeks later at Hajarna, with a secret comm-link needle when catching the Devoronian, and 10 yrs later at her meeting with Karoly in an "elaborate plaited hairstyle." Since its the only references to her hair at all in the Thrawn Trilogy, I think we can assume it was part of her deceptive uniform as Mazzic's bodyguard, along with the gown. Its intricate, involves 6 needles and evidently uses no pins or extras, as when she pulls them out to use them, her hair falls down in a bunch of braids. Then in the Hand of Thrawn books, where she's being Karrde's bodyguard, it never mentions her needles as weapons. In fact, she has to resort to using coffee mugs etc. as stun weapons (which she's good at...). If she has the needles she would have used them. Which suggests, as Karrde's quasi-bodyguard, where she didn't have to pose as a decoration (with the exception of when then met Bombassa) that she spent considerably less time on her hair. She wore practical clothing on that trip, jumpsuit and a robe/tunic type of practical clothing. She would still have all that hair, having just left Mazzic's service. I'm guessing she wore it either in a practical braid(s) or bun, as she is a real warrior. You need to keep your hair out of your face somehow. I keep thinking if she had a bun, buns are held by needles, and she would have used the needles, so it would probably be a braid of some kind, given her proficiency at braiding for 10 yrs, I think that's the most likely.